The Medicean Villa dell'Ambrogiana, located near Montelupo Fiorentino, is one of the largest of the Medici hunting lodges still extant. 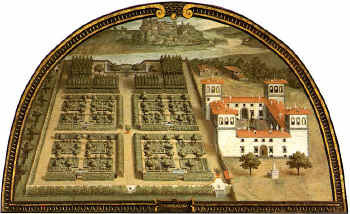 The land and farm buildings, presumably including a villa, belonged to the Ambrogi family (hence the name) and were acquired by the Medici family prior to 1574. 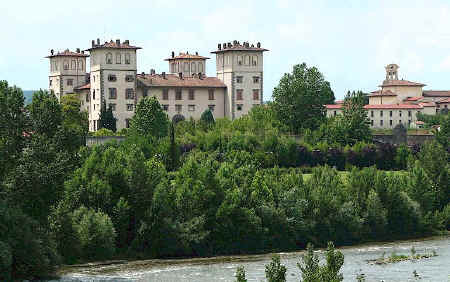 The Medici particularly appreciated the proximity of fishing and hunting along the road to Pisa. The reconstruction of the building as a luxury residence began in 1574. Reconstruction of the villa started in 1587 under Ferdinando I, on the foundations of the previous building, and later it became one of Cosimo III's favourite rural retreats. belonging to the Grand Duke Ferdinando I de' Medici, and displayed now in the Museo di Firenze com'era. The layout of the villa, a square with four towers, suggests that the architect might have been Bernardo Buontalenti, but in fact the architect who designed the new structure has never been positively identified. What is certain is that Raffaello Pagni and Gherardo Mechini initially supervised the works from 1602 onwards. Today, the Tadda's Manneristic grotto and waterworks are no longer visible. As with other Medicean villas, numerous painters decorated the walls and rooms. Construction continued in the 17 C near the Villa with the addition of a church and a convent dedicated to San Pietro d'Alcantara. With the arrival of Christine of Lorraine, the Villa dell'Ambrogiana was included in the properties directly owned by the Medici family. Unfortunately, the closeness of the villa to the Arno has always jeopardised the beauty of the complex, which was too often subject to flooding that compromised its structure. In the 19 C, the decision by the Grand Duke Leopoldo II to transform the villa into a remand home and then into a psychiatric prison contributed substantially to its decline. Fortunately, in recent years the Fondazione Michelucci has devoted itself to the restoration of the villa and gardens. The walls that had always isolated the villa from Montelupo have been removed and the park can now be visited by all those who want to stroll amidst greenery with the evocative background of the Ambrogiana. Montelupo Fiorentino Copyright © ammonet InfoTech 2000 - 2018. All rights reserved.